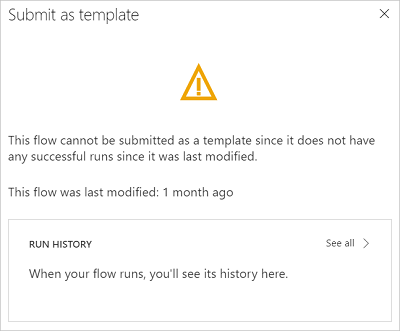 Submit a flow template to the gallery of templates for Microsoft Flow. Templates help people not only to create flows more easily but also to imagine additional scenarios that would benefit from a flow. On the My Flows page, select the ellipsis (...) for a flow. Select Details in the menu that appears. Select More, and then select Submit as template in the menu that appears. Specify a meaningful title, a clear description of the scenario that your template will help automate, the biggest benefit, the number of users, number of runs, and the categories that apply for the template. The Microsoft Flow team verifies and possibly modifies your template. If the team approves your template, it appears in the gallery of templates for Microsoft Flow.